Okay, unlike what seems like EVERYONE, this month, I am not really on the OMG ramps, ramps, ramps I must have NOW bandwagon. Don’t get me wrong, I love their ushering in of Spring, love there oniony-garlicky flavor, but quite frankly they are so thirty-plus years ago for me. Been there, done that, all at the ripe ole age of nine. Oh so ahead my time. After moving to the midwest in the early 70’s (Hinsdale, IL to be exact) I found myself a new BBF, Kim. Well, said BBF and I were playing outside (cuz yeah, back then that is what you did, no inside on the Wii or PC for us) in the woods behind her house (which was technically Oak Brook: tip off for you foragers out there, then again guessing development over the years has wiped out the ramps) we came upon an absolute SEA of ramps or what our nine year old selves called wild onions (I mean who was on the ‘ramp’ trend back then?). Now after all that ramp-reminiscing I am craving the stinky little weed. Do like them pickled, or roasted, but on a cold wet day it’s in a cozy comfy pasta dish that I am a hankering for. I am hoping that the Pasta Puttana has her ramp pasta at Green City tomorrow (had some last year and it is oh so good) but meanwhile I want some pasta today. And thanks to my friend Bernie (she who has provided the gorgeous pictures on this post – this gal can shoot food!) for turning me onto this quick ramp pasta recipe from epicurious.com. 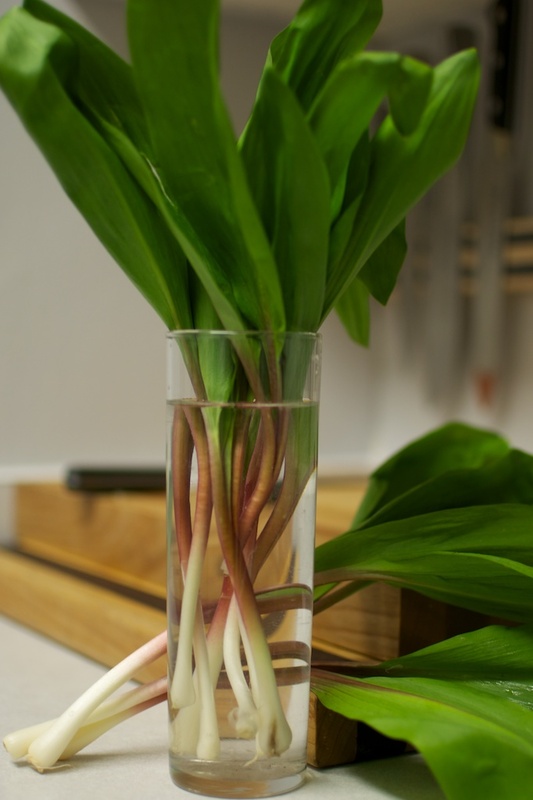 Trim roots from ramps and slip off outer skin on bulbs if loose. Blanch ramps in a 6-quart pot of boiling salted water, 2 to 3 seconds, and transfer to a cutting board with tongs. 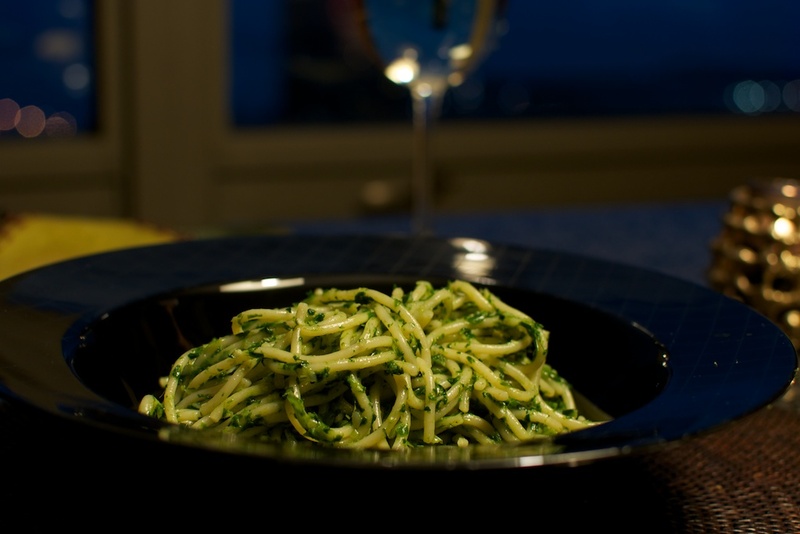 Coarsely chop ramps and put in a blender with zest and oil. Add spaghetti to boiling water and cook a few minutes, then ladle out 1/2 cup pasta water and add to blender. Purée ramps until smooth and season with salt. Continue to cook spaghetti until al dente, then ladle out about 1 cup additional pasta water before draining spaghetti in a colander. Return pasta to pot with ramp purée and toss with parmesan over moderate heat 1 to 2 minutes, thinning sauce with a little pasta water as needed to coat pasta. This entry was posted in To Market with Mo, Uncategorized and tagged Chicago Area farmers marekts, Chicago Farmer's Markets, Evanston Farmer's Market, Farmers Markets, fresh organic, fresh seasonal organic produce, Glenwood Sunday Market, Green City Market, lemonade stand, moira's blog, pasta puttana, Ramps, sustainable, to market with mo, wild onions. Bookmark the permalink. Great Idea! I have acutally started cooking, odd at my age I know, but I’ve had fun times and yes, a little frustration from time to time. My main focus is to cook things either that my sweetie Davie doens’t tend to make, or make something that is a little unusual, at least to my palatte and those of my north shore friends. This sounds like it will make it to the menu one day next week! WOW — you go girl. can’t wait to hear how it goes!